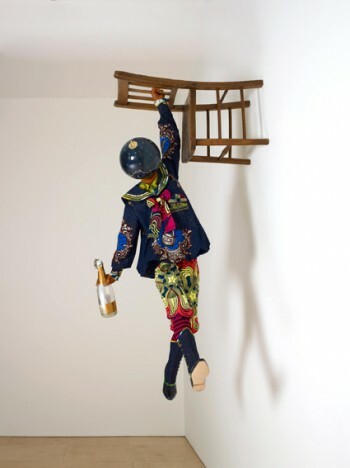 Stephen Friedman Gallery will open a solo exhibition of new works by Yinka Shonibare, MBE. This exhibition of all new works focuses on the corruption, excess and debauchery that have in part led to the current economic crisis. With characteristic wit and critique, Yinka Shonibare explores the contemporary worship of luxury goods and the behaviour of the banking industry while referencing well known iconography and art historical homage – most notably in his creation of a large tableau based on Leonardo da Vinci’s ‘The Last Supper’. POP! not only presents some of Shonibare’s most ambitious work of late but also reflects the artist’s engagement with social commentary. It heralds a new direction for the artist with large-scale self-portraits inspired by Andy Warhol’s 1986 series ‘Camouflage’. The exhibition provides a unique opportunity for audiences to assess Shonibare’s most recent lines of enquiry.